If you are a Salesforce admin or consultant, you live in a world of ERDs. As you program your CRM to automate processes, collect and analyze data, and become a more effective tool for sales reps (or as you advise other companies on how to implement or revamp Salesforce), you use entity-relationship diagrams as a visual representation of the database. ERDs make it easier for you to see how data is set up, how different types of data interact, etc. But unfortunately, there hasn’t been an easy way to build out the ERD itself. Sure, you can manually draw out your ERD, but that process could take hours. Or you can use Schema Builder within Salesforce to view and customize all the objects and relationships in your CRM, but this tool immediately implements any changes you make. It just won’t work if you simply want to visualize hypothetical changes or plan for the future. With our new Salesforce Schema import, you can authenticate Salesforce and import your schema directly into Lucidchart in seconds. Automatically visualize every table and relationship, and then use our intuitive interface to move symbols around and quickly start finding ways to customize Salesforce. Ready to map out your Salesforce database automatically? Follow these steps to import your schema, generate an ERD, and optimize your CRM faster. 2. 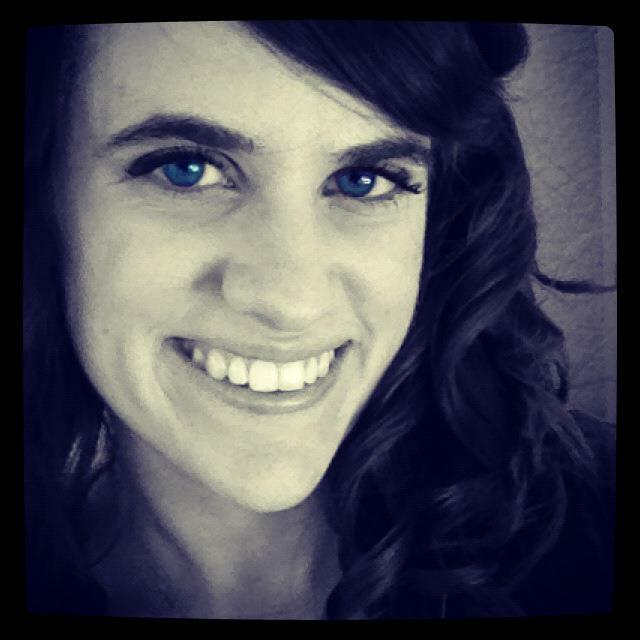 Click “Salesforce Import” in the Entity Relationship shape library. Alternatively, navigate to File > Import Data > Salesforce > Schema Import OR File > Import Data > Entity Relationship > Salesforce Import. 4. In the next window, click “Allow” to grant permission for Lucidchart to access your Salesforce account. You can revoke access at any time in your personal settings. 5. 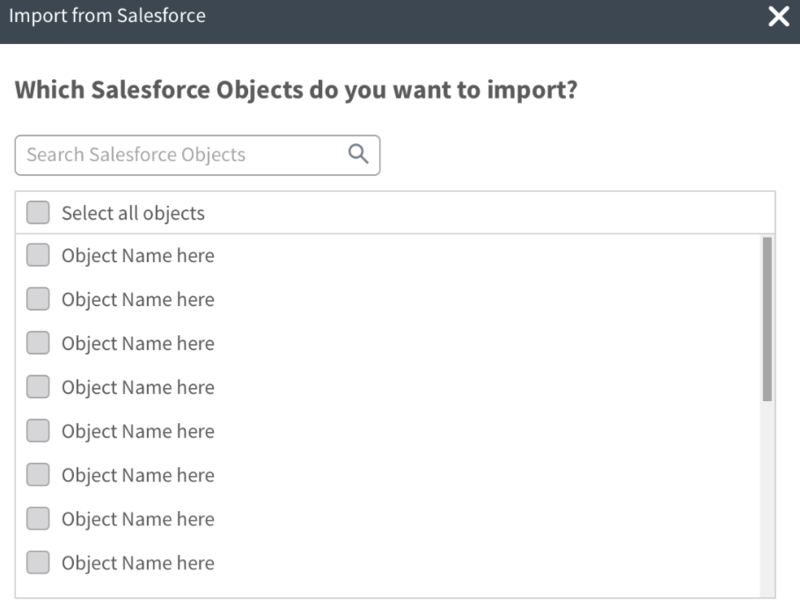 In the next window, select which Salesforce objects you would like to import into Lucidchart. Search for specific objects using the search bar at the top. If no objects are found, you will be prompted to adjust your search term. 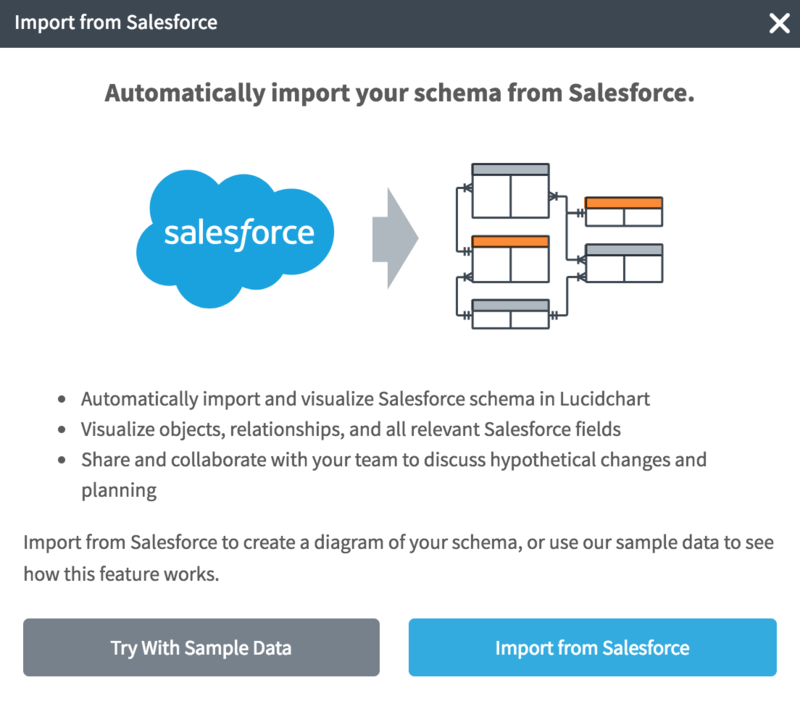 You may have a difficult task ahead of you in managing and optimizing Salesforce, but Lucidchart eases the burden—try our Salesforce Schema Import to visualize and optimize your database efficiently and effectively.